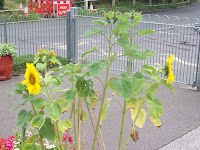 Earl Soham Community Primary School Blog: On a Brighter Note! 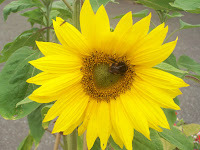 I took these photos this morning (can you see the bee?) and I won't use any camera tricks to make mine appear bigger than what they actually are! My tallest sunflower now stands at a 'magnificent' 95cm. I don't think that it will be the tallest - but it is beautiful!